Hi there and Happy *wonderful* Wednesday to you! The weather has been gorgeous here in Texas, this week. I know some of you out there aren't experiencing such nice weather, unfortunately. :( I actually got a bit of a sunburn yesterday, while out for a walk with my neighbor and our dogs. Emmitt and Ozzy are just smitten with her two Schnauzers, it's so cute. As soon as I saw this beautiful color combo announced at the Color Throwdown this morning, I knew exactly what I wanted to make. I LOVE this mix of colors and will definitely be using them again! I busted out my Paper Snips to cut out all of these flowers from my (very neglected) Vintage Vogue set. I'm not usually fond of cutting out small images but I had a lot of coffee this morning, so I was pretty amped up. These are fairly easy to cut though, and they add so much dimension to the card this way, popped up on Stampin' Dimensionals. The large flowers were inked up first in Soft Sky, then around the edges in Baja Breeze, then just barely around the outer edge in Crumb Cake, using the Rock n' Roll Technique. I'm in a phase right now where I seem to be sponging ink around everything lately, haha! EVERY single part of this card (except the pearls and the ribbon) were sponged with Crumb Cake ink. The sentiment, stamped in Crumb Cake ink, is from the Friends 24/7 set. I then took my Blender Pen and shaded the letters with Baja Breeze ink for some more color. Anne Marie, This is so beautiful! I love how you have framed the sentiment with those hand cut flowers. I too have been sharing your sponging efforts:) The pearl jewels are just the perfect accent - Just fabulous! What a beautiful card! Congrats on your PP DT gig and thanks so much for playing along with us at the Color Throwdown! wow... what a beautiful card! Thanks for sharing your talent! Just beautiful Anne Marie! LOVE those colors together too. Gorgeous. Also, CONGRATS of being named to the Paper Players DT!! How very exciting. Anne Marie, this is breathtaking! You rocked this color challenge and the paper snips! 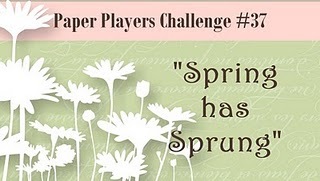 Looking forward to seeing your designs over at the Paper Players! Congrats!!! Your work is so awesome that is wonderful. Your card today is just stunning. Love the DSP and the crimped cardstock and what can i say the flowers are beautiful in the colors. Give all the puppies a belly rub. What a beautiful card. The colors are great as is the layout. BEAUTIFUL! Thanks for joining us for the Color Throwdown! Dear Anne Marie. Wow, You're not alone a great card maker, but your photo's a beautiful too. Isn't a blog great.. I love your blog. You are a true inspiration to me.. Thanks for making me smile today. Congrats on your DT invite ... well deserved. Your card is so very, very pretty. The pleated ribbon and all of the pearls sure add a touch of elegance. Only one problem with your post today ... where's a photo of all of the puppies out for a walk?!!! I love this card! It is beautiful. I love this set and you did a great job with the colors (I saw that one and moved on quickly). Wow, this is beautifully done! That sentiment has to be one of my favorite from SU! of all time! I sadly neglect it too, but you've inspired me to bust it out with the beauty of a card! Thanks for sharing it with us at the CTD! Oh Anne Marie, this is gorgeous! I love all the wonderful details; the colors and flowers are stunning. Such a beautiful card . . . so many wonderful details -- let's just say I love them all!! Congrats on the the Paper Players invite. I can see why. I just love all the cards you do. So talented. Can't wait to see what you come up with. How fun! Anne Marie, this card is GORGEOUS! Beautiful. I love it so much! This is pretty much my all time favorite color combo, too. Great job! Wow! This is a beauty!!! You are right... those colors are fantastic and this card showcased them perfectly. I love the way you did those flowers... with a shabby flair yet the pearls in the middle adds such elegance... pure bliss! It's so, nice to cyber meet ya and thank you for visiting my blog. You made a beautiful detailed card & with lovely pleating. Absolutely beautiful card. This is a great color scheme. Love you ideas. They say "it's in the details" and boy have you ever proven that. This card is so beautifully put together. I love the pearls, the ribbon, the sponging........ just everything. TFS! Stunning card Anne Marie, wow, love the flowers with the little flowers inside (doing that for sure) and all the sponging...I'm on the same kick, can't seem to put my sponges down ~ TFS ~ have a super day! Just gorgeous! I love the sponging and dimension of your flowers! Very elegant! Thanks for playing the Color Throwdown! I am so excited to have you on the PP team! I am going to have to step up my game to keep up with you! This is fabulous! This set was a must-have for me and I haven't used it in a while--I need to get it back out! Your card is gorgeous! I LOVE this color combo. You met the challenge beautifully. I love the ruffled ribbon. This is so very pretty oh my goodness! Very well done. Anne Marie this is soooooooo pretty. I think Vintage Vogue is one of my favorite "go-to" sets. I think it looks spectcular in any color too, but I LOVE your baja and crumb cake combo ... so soft and pretty. I just discovered you yesterday and I'm hooked on your blog. I love your style, how you explain what you've done and you are just plain hilarious. Every time you post...what a treat! I love your car!!! The color combo is great and I am going to have to try using it. Oh my goodness, Anne-Marie, I missed a few days of blogging and come back to this jaw dropping beauty AND your wonderful news! Congratulations! They are lucky to have you - your cards are SUPERB! This one is just as gorgeous as can be, so full of detail and beauty, gorgeous paper choice! The ribbon is just delightful, truly one to marvel over - Blessings to you! Beautiful stunning card!! Love the color combo and the ruffled ribbon...just gorgeous! Stunning, Anne Marie! I love the ribbon and the pearls! Welcome back to the Players! Stunning! This is one of my favorite stamp sets. Love all those vintage vogue flowers. TFS. Where have I been?! How did I miss this? Just beautiful. I have a soft spot for pleating lately, but I just can't seem to pull it off. You on the other hand...wow! Congrats on joining the paper players team! You deserve it!! Wow - this card is AWESOME!! I love those flowers!!! I wish I could remember to stamp my flowers in white ink - or white emboss them, because it is such a terrific look! Wow! great card. Your going to get me to get this set out. I am ashamed to say I haven't used this set since it first came out.